The Kommersant daily points out that the Malaysia Airlines disaster has not stopped the fighting between government troops and pro-autonomy militias in the east of Ukraine: A ceasefire is in place only in a small area at and in the vicinity of the crash site. As a result of actions by the pro-autonomy militias, the Ukrainian force that tried to cut the self-proclaimed republics off from the border with Russia has itself been surrounded, Kommersant continues. The surrounded troops could be saved by a ceasefire along all sections of the front, which the militia commanders also realize. "That is probably why they have so far rejected all appeals for a lasting and comprehensive ceasefire voiced by the Ukrainian side and international mediators," the paper concludes. The paper points out that the facts available so far indicate that there are Buk surface-to-air missile systems in the conflict zone on both sides of the Ukrainian-Russian border. However, these systems are capable of hitting air targets only within a range of 50 km. "Since the downed Boeing fell on Ukrainian territory 50 km from the Ukrainian-Russian border, one can rule out that it was hit from Russian territory," the paper says. It goes on to add that Kiev does not deny that Ukrainian Buk systems have been deployed on the Ukrainian-Russian border: The Ukrainian air defense systems were probably intended to counter possible aerial reconnaissance from the Russian side. Therefore the Malaysian Boeing may have been mistaken for a Russian Air Force aircraft, writes Nezavisimaya Gazeta. In addition, the paper continues, it is unlikely that pro-autonomy militants could have operated a Buk system as it requires specialist training and experience. Most of the experts polled by NG conclude that the airliner was downed by mistake. "It is likely that this attack was not agreed with the senior leadership, who are now being caused immense stress by the possibility that the truth may be established. Support for those who murder civilians leaves no political chances for a reputation on an international scale," the paper concludes. The Expert magazine gives a detailed account of the search operation at the crash site. It also points out that the UN Security Council is expected to vote in the near future on a draft resolution condemning the destruction of the Boeing 777. The draft resolution, Expert continues, does not only call for "a comprehensive, thorough and independent international investigation in compliance with civil aviation standards" but also lists requirements for the pro-autonomy militias, urging them "to refrain from any actions that could jeopardize the crash site". For their part, the magazine adds, the militiamen of the Donetsk People's Republic have for three days now been guarding the crash scene and ensuring the safety of the OSCE observers working at the site. 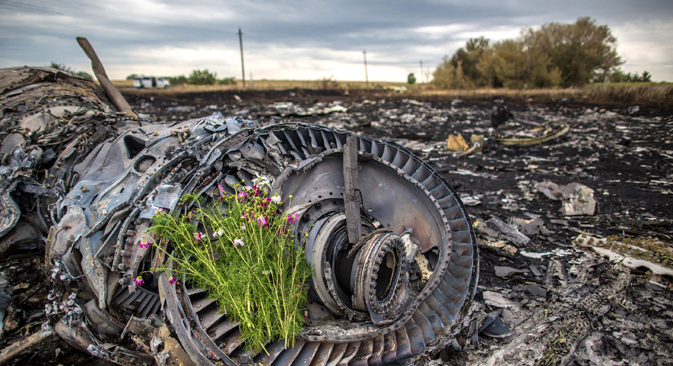 Experts polled by the Vzglyad newspaper claim that "senior figures in Ukraine and the West are using pseudo-facts surrounding the Malaysian Boeing crash.” The investigation into the downing of the Malaysian airliner is not yet over, the paper continues, but the alleged intercepted phone calls between pro-autonomy militiamen that have been posted on the internet have given the leadership of Ukraine and other countries cause to blame what happened on the militias and Russia. Those who are making these statements "are being guided by unverified and even crudely forged facts,” writes the newspaper. "The situation surrounding the tragedy of the Boeing downed over Ukraine has taken unsubstantiated accusations voiced by officials to a new level. Without an investigation or any tests, the Ukrainian authorities have found widespread proof that the militia in the southeast [of Ukraine] were involved in the incident," the paper writes. Furthermore, it adds, Kiev maintains that the Buk surface-to-air missile system that may have downed the Boeing had been supplied to the pro-autonomy militants by Russia and that after the tragedy the militants returned it. The Moskovsky Komsomolets daily quotes a special statement from President Vladimir Putin on the Malaysian airliner crash. In it, the Russian president calls on the warring sides to end the bloodshed and sit down at the negotiating table. According to Putin, the airliner with 298 people on board would not have been downed, had military operations in the east of Ukraine not been resumed. "One can confidently say that had the military action in the east of Ukraine not been resumed on June 28, this tragedy, most certainly, would not have happened. At the same time, no one should or has the right to use this tragedy to further one's mercenary political aims. Events like these should bring people together rather than push them apart," the paper quotes Vladimir Putin as saying.